As “Game of Thrones,” “Veep,” and “Silicon Valley” all wrap up their respective seasons in late June, it’s come time for HBO to look ahead to the fall and see what exciting new shows they have to dominate the airwaves. Today, HBO announced four exciting debuts for this upcoming fall season. At the top of the list is “Westworld,” a one-hour sci-fi thriller series about the dawn of artificial consciousness and the evolution of sin, based on the 1973 film of the same name written and directed by Michael Crichton. Next, Sarah Jessica Parker’s new half-hour comedy “Divorce,” about Frances (Parker), a woman who reassesses her life and marriage and finds starting over to be more difficult than she imagined. Then, Issa Rae’s “Insecure,” about the friendship of two black women and their uncomfortable, racy experiences navigating the world at large. Finally, there’s “High Maintenance,” a cable adaptation of the popular web series, about a Brooklyn pot dealer (Ben Sinclair) and the lives of his eccentric, neurotic clients. 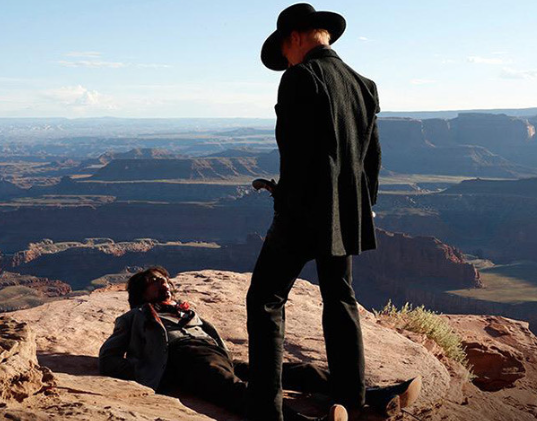 “Westworld’s” expansive cast includes Anthony Hopkins (“The Silence of the Lambs”), Ed Harris (“The Right Stuff”), Evan Rachel Wood (“Mildred Pierce”), James Marsden (“30 Rock”), Thandie Newton (“Mission: Impossible II”), Jeffrey Wright (“Only Lovers Left Alive”), Tessa Thompson (“Creed”), and more. It was created by Jonathan Nolan (“Memento”), who also directed the pilot, and Lisa Joy (“Burn Notice”), and executive produced by J.J. Abrams and Bryan Burk (“Star Wars: The Force Awakens”). “Divorce” also stars Thomas Haden Church (“Sideways”), Molly Shannon (“Year of the Dog”), Talia Balsam (“Mad Men”), Tracy Letts (“Bug”), Sterling Jerins (“The Conjuring”) and Charlie Kilgore (“Moonrise Kingdom”). The series was created by Sharon Horgan (“Catastrophe”) and produced in part by Sarah Jessica Parker and Paul Simms (“NewsRadio”). “Insecure” stars Issa Rae (“Awkward Black Girl”), Yvonne Orji, Jay Ellis (“The Game”), and Lisa Joyce (“Ricki and the Flash”). It is created and executive produced by Issa Rae, and Larry Wilmore (“The Nightly Show with Larry Wilmore”) serves as a consultant. “High Maintenance” was created and written by the married duo of Katja Blichfeld, who worked as a casting associate on “30 Rock,” and Ben Sinclair, who stars in the series. It’s executive produced by Blichfeld, Russell Gregory and Ben Sinclair. No premiere dates have been set for any of the series.